We’re Really Thankful For Our Customers! Published by Bonnita Calhoun Comments Off on We’re Really Thankful For Our Customers! At Stellar Signs & Graphics, we’re very thankful for each and every one of the amazing individuals that we get to call our clients. It means a lot to us that you would trust our team of signage experts to handle the tasks of manufacturing the signs that represents your business. We know how much your business means to you because we know how much our business means to us! It’s a true honor to be given the responsibility of making your business look good. We take great pride in making our clients look good. And we’re incredibly thankful for those clients who are so impressed with our work that they come back to us to complete more projects. 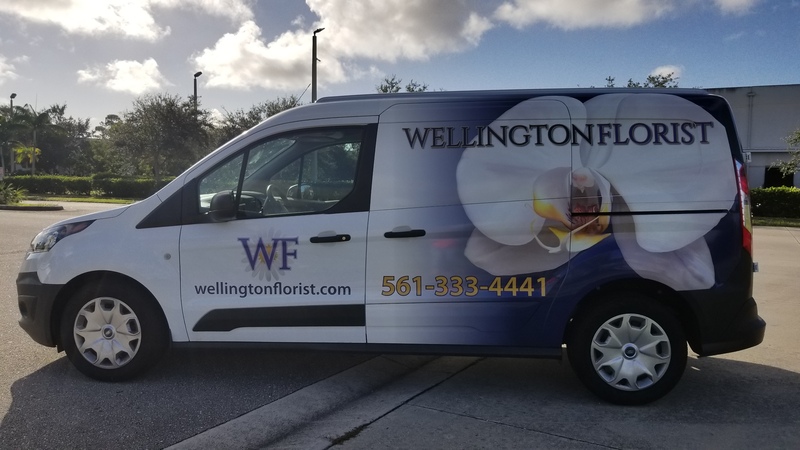 We recently had the pleasure of working on a second vehicle for the awesome team over at Wellington Florist. 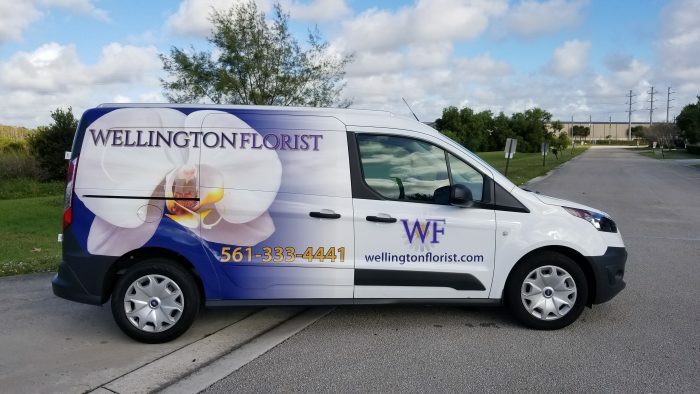 As you can see in the photos both above and below, their company vehicle is beautifully designed with the company’s logo, phone number, website and, of course, a gorgeous flower. Thank you Wellington Florist! We’re so happy to have you come back for this second vehicle wrap project. We should point out that although our team is appreciative of its customers all year round, we are all in the thanking mood, at the moment, because Thanksgiving comes this week. We’d like to take this opportunity to wish each and every one of you a very happy Thanksgiving! Please make note of our holiday hours. It’s also important for us to mention that our business hours will be adjusted so that our team can observe the holiday. We will be closing early tomorrow to get a head start on Thanksgiving which is on Thursday. We will remain closed for the holiday, throughout Friday and the weekend and then open back up on Monday, November 26th. Please feel free to share your favorite Thanksgiving recipes on the Stellar Signs & Graphics Facebook page! We’d be very curious to learn about the various treats that grace your dinner tables during the holiday. In the past week, our team has learned of many different traditions that are celebrated by our friends and colleagues throughout the country and Canada. And please don’t forget that until Thanksgiving arrives, the Stellar Signs & Graphics team is happy to help you with all of your signage needs. Our experts serve the business communities in and around Palm Beach County, West Palm Beach, Royal Palm Beach, Wellington, Lake Worth, Boynton Beach, and Greenacres, Florida. Please don’t hesitate to give us a call at 561-721-6060 today!